Active galactic nuclei (AGN) are one of the most energetic and mysterious phenomena in the universe. 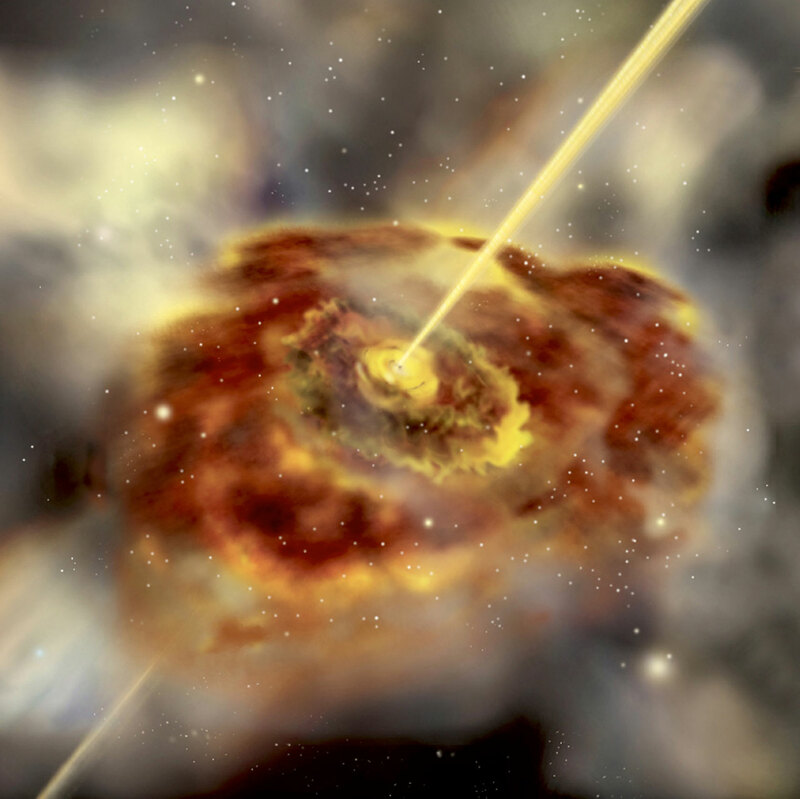 In some galaxies indeed, the core generates amounts of energy which surpass those of normal galaxies, such as the Milky Way, by many orders of magnitude. The central engine of these power stations is thought to be a supermassive black hole. Indirect lines of evidence have suggested that these massive black holes are enshrouded in a thick doughnut-shaped structure of gas and dust, which astronomers call a "torus". However, due to the limited sharpness of images that can be obtained with present telescopes in the 10-m range, such a torus has never been imaged to date. Using the new and powerful VLT Interferometer  - a mode of the ESO Very Large Telescope that combines light from at least two telescopes to obtain information on very fine scales - a team of European astronomers  has succeeded for the first time in resolving structures in the dusty torus of the prototype AGN, the famous galaxy NGC 1068. The structures have a size of roughly 0.03 arcsec, corresponding to about 10 light-years at the distance of the galaxy. This important achievement shows that the VLT Interferometer, using the recently inaugurated MIDI instrument , proves an invaluable tool in the study of objects outside our own Galaxy. Active galaxies are among the most spectacular objects in the sky. Their compact nuclei (AGN) are so luminous that they can outshine an entire galaxy. These objects show many interesting observational characteristics over the whole electromagnetic spectrum, ranging from radio to X-ray emission. Active galaxies take many forms: some have bright nuclei emitting high-energy (i.e. ultraviolet and X-rays) photons, some have high-energy nuclei but appear to be surrounded by a more-or-less "normal" galaxy, while some have long narrow jets or beams of matter streaming out from the centre. There is now much evidence that the ultimate power station of these activities originate in supermassive black holes with masses up to thousands of millions times the mass of our Sun. The black hole is fed from a tightly wound accretion disc encircling it. Material that falls towards such black holes will be compressed and heated up to tremendous temperatures. This hot gas radiates an enormous amount of light, causing the active galaxy nucleus to shine so brightly. The central region of an active nucleus is currently believed to be surrounded by a doughnut of dense and opaque gas and dust. It was first thought that the different types of active galaxies were fundamentally different objects. Astronomers now prefer the so-called "unified" model of AGN, meaning that most or all AGN are actually just different versions of the same object. What the object looks like depends on the orientation of the doughnut on our line of sight : can we see through the doughnut hole deep into the bright centre or can we only see the opaque walls ? Some AGN appear indeed very luminous because we see straight down to the emission site, while others would be very dim, since the torus hides the central power station from our view. These doughnuts or tori are, however, very difficult to resolve because of their very small size, typically a few tens of light-years. For the nearest active galaxy, this corresponds to an estimated angular diameter less than 0.05 arcsec, much smaller than what can be observed with present single large telescopes in the 10-m range. Since, so far, evidence for the tori is only indirect, a large variety of models has been proposed as to how these tori could be, varying from very dense and compact tori, to very extended and fluffy tori. What the astronomers really need, in order to differentiate among the models, is a direct image of a torus. But until now, no telescope could see sharp enough to spot one. This is where interferometry with large telescopes makes a difference. Interferometry is the technique which combines two or more telescopes to achieve an angular resolution equal to that of a telescope as large as the separation of the individual ones. The recently inaugurated ESO Very Large Telescope Interferometer on top of the Paranal mountain has the ambitious goal of making interferometry a tool available to every astronomer. Just a few months ago, the first of the powerful instruments for the VLTI was installed, the 10 micron beam combiner mid-infrared interferometric instrument. This will be followed in early 2004 by the AMBER instrument . 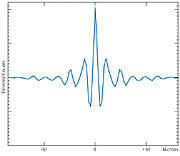 MIDI is sensitive to light of a wavelength near 10 microns, i.e. in the mid-infrared spectral region (the so-called "thermal infrared"). Located at the heart of the VLT Interferometer with its multiple baselines of up to 200 m, MIDI can reach an angular resolution of about 0.01 arcsec. Combined with two powerful 8.2-m VLT Unit Telescopes, MIDI has for the first time in infrared interferometry enough sensitivity to study objects far away from our galaxy, the Milky Way. With its high sensitivity to thermal radiation, MIDI is ideally suited to study cosmic material near a central object and heated by its radiation. The ultraviolet and optical radiation from the hot material surrounding the black hole indeed heats the dust torus to several hundred degrees. The absorbed energy is then re-radiated in the thermal infrared between 5 and 100 microns. The MIDI instrument on the VLTI is thus the most appropriate instrument to peer at the enigmatic dust and gas tori believed to be located around giant black holes at the centres of quasars and Active Galactic Nuclei. 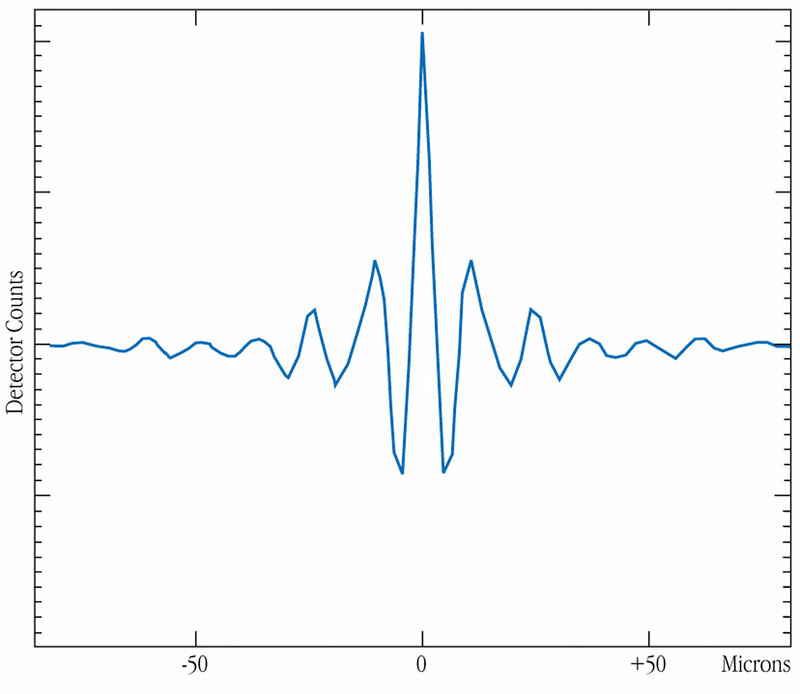 And since nobody has ever been able to use interferometry to study faint objects in the thermal infrared, MIDI enters into a whole unexplored territory. On the nights of June 14 to 16, a team of European astronomers  conducted a first series of observations to verify the scientific potential of MIDI on the VLTI. Among them, they studied the active galaxy NGC 1068. NGC 1068 is among the brightest and most nearby active galaxies. Located in the constellation Cetus at a distance of about 60 million light years, it is also known as Messier 77. It is in fact one of the biggest galaxies in Messier's catalogue and one of the first recognised spiral galaxies. On optical images, NGC 1068 looks indeed like a rather normal barred spiral galaxy. The core of the galaxy, however, is very luminous not only in the optical, but also in ultraviolet and X-ray light. A black hole with a mass equivalent to approximately 100 million stars like our Sun is required to account for the nuclear activity in NGC 1068. 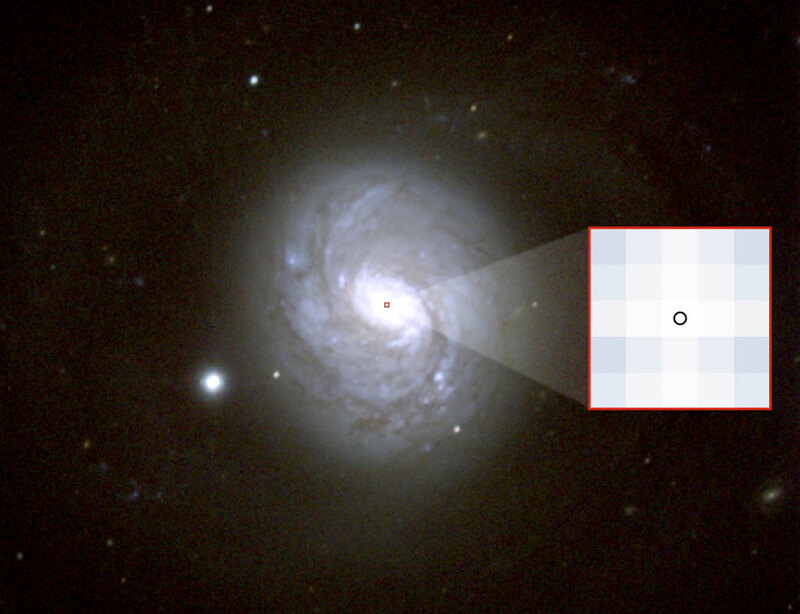 The MIDI observations used two of the 8.2 m VLT Unit Telescopes (Antu and Melipal), separated by a baseline of 102 m. Due to projection effects, the actual baseline for the NGC 1068 observations amounted to 79 m. While observing NGC 1068, the astronomers detected interferometric fringes. Fringes are produced when beams of light from two telescopes are brought together exactly in phase. For a point-like source, such fringes have the maximum possible theoretical contrast (i.e. 100%): the source is unresolved. However, sources of increasing angular size produce fringes with decreasing contrast. In the case of NGC 1068, the measured contrast was only about 10% of the maximum one. An exact interpretation of this result will follow in the context of additional measurements along different baselines, which are planned for this coming Autumn . Already this initial result is nevertheless very convincing: the fringes were obtained with consistent values on several measurements over 2 consecutive nights, thanks also to the excellent observing conditions at the Paranal site ("seeing" values were between 0.3 and 0.6 arcsec). It is already possible to state that a structure on a spatial scale of approximately 0.03 arcsec (corresponding to about 10 light-years) has been detected in the dust torus in NGC 1068. This measurement represents the first observation ever by the technique of long-baseline interferometry of an extragalactic object in the thermal infrared. This new success of the VLTI opens the door to a completely new field in astronomy: the study of gas and dust structures surrounding and feeding the biggest monsters in the universe. MIDI and the VLTI will offer for years to come the best combination for astronomers from all over the world to carry out these studies. More information about the VLTI and photos of many of the components of the facility are available at the VLTI website. The observations were planned and carried out by a team led by Andrea Richichi (ESO) and including C. Leinert, R. Koehler, K. Meisenheimer (MPIA), R. Waters (Amsterdam), F. Malbet (Grenoble), M. Schoeller, S. Morel , F. Paresce, A. Glindemann, M.Tarenghi (ESO), H. Roettgering and W. Jaffe (Leiden). The MIDI instrument (http://www.mpia-hd.mpg.de/MIDI/) is the result of a collaboration between German, Dutch and French institutes. NGC 1068 is well visible in September/October. The present measurement was obtained under demanding pointing in June, in the very last hour of the night.